February 22, 2015  In this week's puzzle, every answer is the name of an Academy Award winner or nominee for best picture. Using a given anagram, decipher the title of the film. The films will go from oldest to newest. February 15, 2015  Every answer is a word or name of three or more syllables in which an interior syllable is an accented "la." Also: The answer to last week's puzzle. February 8, 2015  For each familiar two-word phrase, use the first three letters of the first word and the first three letters of the second word to start two other words that have opposite meanings of each other. February 1, 2015  Every answer is a made-up two-word phrase, where the second and third letters of the first word are switched to get the second word. 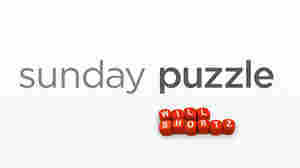 January 25, 2015  Every answer today is a word starting with the letters A-R, which you will identify from its anagram. For example, given AR plus ROB, the answer would be "arbor." January 18, 2015  Every answer is a familiar two-word phrase or name, with the initials S.V. For example, given "noted Idaho ski resort," you would say "Sun Valley." January 11, 2015  For each familiar two-word phrase and name, take one or more letters from the start of the first word plus one or more letters from the start of the second word to name a country. January 4, 2015  Given a clue, each response is a two-word answer with the first word starting with B-R and the second word starting with R.
December 28, 2014  Do you remember who was in the news this year? Given the name of someone who first popped up in the news in 2014, explain who that person is. December 21, 2014  Every answer is the name of a kid's toy that one might give for Christmas. Some are brand names, some are generic. Identify them from their anagrams. December 14, 2014  Every answer is the name of a Fortune 200 company —that is, one of the top 200 corporations, according to the 2014 list in Fortune magazine. December 7, 2014  Every answer today is a familiar two-word phrase or name with the initial letters N and O.
November 30, 2014  This week we're playing a game based on the word "blast." Given a category, name something in the category starting with each letter: B-L-A-S-T.
November 23, 2014  Given two words, change the first consonant sound in each word to the same new consonant sound and you'll phonetically name two things in the same category. November 16, 2014  Every answer today is a rhyming two-word phrase in which each word has two syllables and the first word ends with a doubled consonant plus the letter Y.